China has been clamping down on official malfeasance lately, but corruption trials have a long and storied vintage in the realm. The very oldest casket in the cellar has stamped upon it this date in 1952, when Maoist China carried out its first corruption executions. “Faithful and unyielding” during wartime, Liu Qingshan and Zhang Zishan exploited their resulting positions of authority to plunder economic development money. I learned from the newspaper that corruption and waste had become very serious problems indeed. It also revealed how Party cadres had degenerated from revolutionary heroes into grafters. 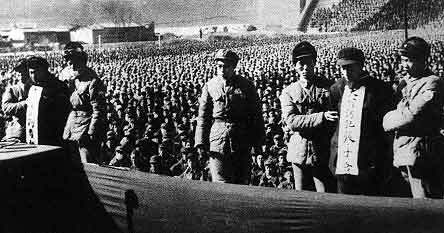 The best example we were told of was two senior cadres, the secretaries of the Tianjin Prefectural Party Committee, Liu Qing-san and Zhang Zi-shan, who were even sentenced to death for their crimes. The Party wanted to show that its own members were not exempt from justice. In showing this, they concurred with the old Chinese belief that it was best to execute one as a warning to a hundred. Took the words right out of Mao’s mouth. Only if we execute the two of them, can we prevent 20, 200, 2,000 or 20,000 corrupt officials from committing various crimes.